TL;DR Software Engineers see world in patterns, they look for common denominators, not accepting the fact that something may be an one & only instance. That's why we sometimes end up building frameworks for single problem occurrences ("we'll gonna need it in future") or try to squish accidentally similar concepts into one, common form - ignoring the fact that Domain experts don't recognize this similarity (it has no advantage in terms of domain, it doesn't constrain real-world domain development). The proper answer is (of course) to fight off instinct of pre-mature generalization & ... duplicate. It always starts with two. Two of Something. Cases. Actions. Items. Entities. States. Whatever. It takes only a fraction of second for an eye of a skillful engineer to detect common parts: behaviour / properties / whatever. Let's build a piece of framework around it so AAAAALL the future cases will immediately snap into where they belong! ... which they never do. "How is it even possible that they didn't notice that? Fortunately they have US! We came & scratched down the foundation of a framework in 5 minutes!" Do you wait until you have at least 3 instances of "something" to draw first conclusions whether there's actually a real regularity in-game? Do you confirm these findings with the actual perception of various actors who deal with this "something" in real Domain? Do you understand the difference between domain modelling & forceful application of object-oriented design? But shouldn't we pro-actively look for patterns, unification & general code re-use? Otherwise we may end up with duplicating code which is supposed to be one of software engineering deadliest sins (as in DRY), right? 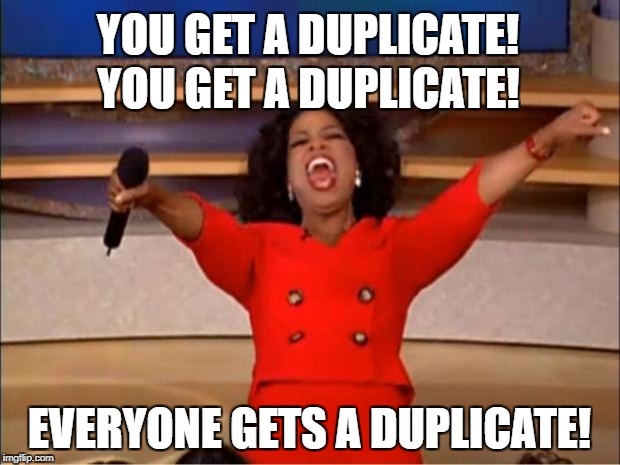 Duplicating code is ... OK! As long as a change to the system won't cause all of copies to be "touched" (modified). If changes are local to particular copy (instance), duplication is more than justified - you just let the variants diverge in directions determined by continuously emerging requirements. It may be less appealing for your engineering ambitions, but ... this is how real world works - concepts like inheritance or polymorphism look great in Animal + Cat + Dog tutorial, but reality is far more complex (even its simplified version we're supposed to model while building software). Pic: © 1999 Astralwerks. All rights reserved.